Our mission at DogsWorld is to make sure that your dog will have the most fun, fulfilling time they could have, in the healthiest and safest environment possible, when you can’t be there to take care of them. That is our promise, whether they come for extended dog boarding, dog daycare or just a quick visit to our spa. 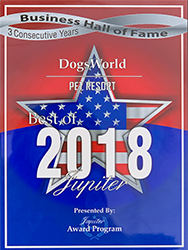 In order to make this a reality we have designed a new, better kind of experience so that both our clients and their canines can enjoy the dog lifestyle to the fullest. 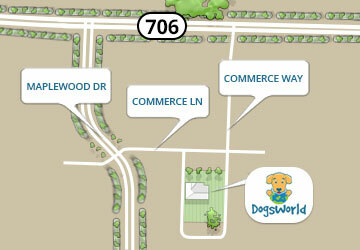 We offer high quality overnight dog boarding in our state of the art two story canine hotel in Jupiter, FL. Your dog will enjoy staying in our spacious luxury rooms and suites as well as access to indoor and outdoor play. Because we know you want peace of mind while away from your furry family member our dog boarding facility is staffed round the clock and we perform regular wellness checks throughout your dog’s stay. Dogs who come for daycare at DogsWorld will spend their time divided between indoor and outdoor play, with appropriate down time throughout the day. Dogs are supervised at all times to make sure they are having an enjoyable daycare experience. Much of the time our daycare guests will be playing and romping with other furry friends or our staff in The Wag Zone, our 7,000 square foot naturally landscaped dog park. Treat your dog to a luxurious spa experience at DogsWorld. Whether your dog would like just a bath or additional spa services as well, our staff will give them the pampering they deserve. Our other spa services include ear cleanings and nail trims. The utmost care is given to ensure that our staff members are thoroughly trained. We do this so that all of our spa guests may have as enjoyable an experience as possible. Proper and positive training is the key to the best possible relationship with your dog. Our training options include Private Dog Training lessons, Lodge and Learn programs and Day Training sessions scheduled in conjunction with our Dog Daycare program. Give us a call if you have any questions and to schedule a free dog training evaluation with one of our professional trainers. Call Us For More Info Or Check Out Our Special Offers!